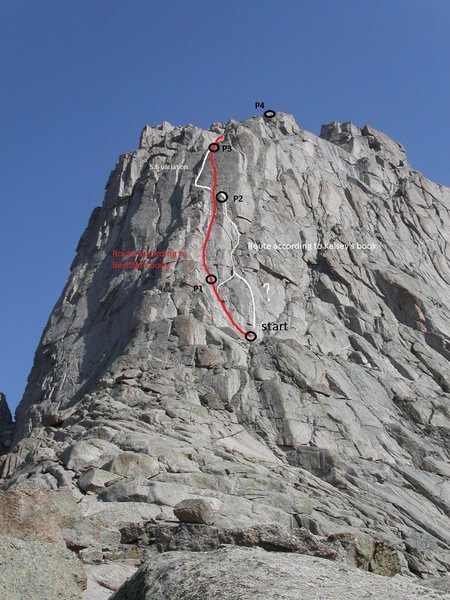 A nice little route with two really nice pitches. This description is for the 5.8 variation, but the route goes at 5.6 also. P2: For the 5.6 variation head left to a dihedral. For the 5.8 variation, head straight up the fine crack (wide to start, then hand/finger) and at the split head left. This sews up and is the best pitch of the route. P3: Easy scrambling to the top. Scramble up to the base of the shoulder via 4th class sections on the east side. Descent: rap off fixed anchors using two ropes then downclimbing. Top of the K Cracks father/son photo. Jen coming up the K Crack. Chuck and I on top of Pingora. One of our many trips to the Winds. Pitch two as we climbed it. 1993: Rained on for 6 days, 7th day dawned very clear, did this route on that final day with Fred Batliner. K-Crack was superb, very similar to a Joshua Tree pitch, but in a wonderful American West alpine setting. -rap number one to a likely seldom used, slung thread climbers left of the K Cracks. Exactly 25 m.
-rap 3 straight down, about 20m. To an excellent stance with a funny, double-body-size protruding horn. -Number 4 goes straight down too, to a slung thread at a small stance. -Number 5. 25m gets you to the top of a fourth class down climb onto walking terrain. I'm confused.. bechtel's book has two pitches before the k cracks, 220ft total both at 5.6.. did you climb the corners to the left of the route? because those are 5.7's. P1-"climb up ledges and cracks to a right-facing handcrack dihedral. climb this past small ledges to a nice belay on a large ledge. 100 feet"
Here's a pic I ripped from one of the posts here. Tried to outline what I thought was the route. Some disparities between guidebooks, which is weird considering it seems like such a straightforward climb. Let me know if I screwed anything up!